The Trail to Rancho T | Food and Drink | Style Weekly - Richmond, VA local news, arts, and events. 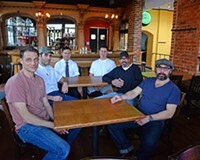 Scott Elmquist Justin Tingley, Aaron Cross, Arthur Grant, Billy Fallen, Tuffy Stone and Ed Vasio make up the team behind Rancho T.
Tuffy Stone and Ed Vasaio wanted to open a restaurant together, but they had no idea how it was going to end up. 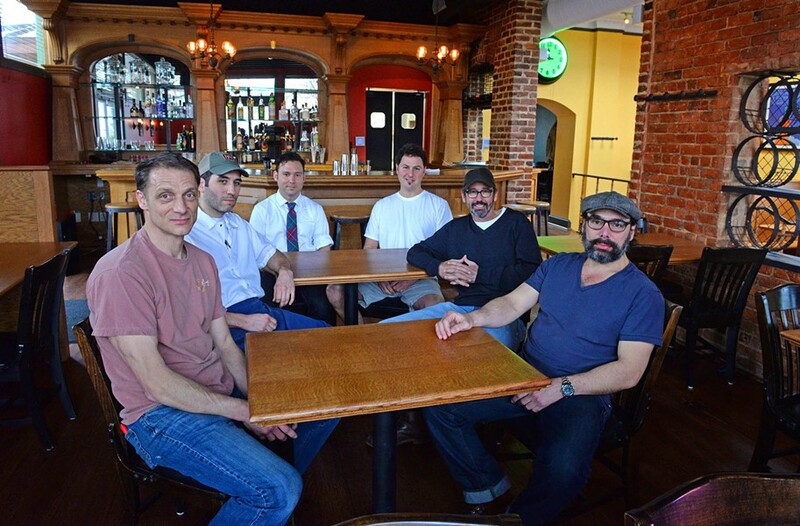 They looked at properties, talked and eventually found a spot on Morris Street, across from the Lamplighter Roasting Company at Virginia Commonwealth University. “We stripped away the modern,” he says. Warm, deeply colored walls, lots and lots of wood, and bright, Polish movie posters have replaced the black floors, gray walls and white modular furniture of the former Sample Restaurant and Bar space. Barbecue champion Stone, star of television show “BBQ Pitmasters” and owner of A Sharper Palate and the Q Barbeque restaurant chain, makes a superhero team with Ed Vasaio, owner of Mamma ’Zu, Edo’s Squid and 8 1/2 and Dinamo. Both have been in the business for more than 20 years, and both, if you glance back at their credits, know what to do to be successful. But their new place is a little different, and the way in which it evolved over the last two years isn’t how most restaurants open their doors. Instead of a particular style of food, the building became the engine that drove the project. The concept was a little more difficult to come up with. “We were headed in a Western direction,” Vasaio says, “headed toward the Americas — including Latin America.” While the two were deciding, Justin Tingley was carefully handcrafting the bar, and Byron and Kalita Pennington of Small Acts Forge were making wire wine racks, creating barstools and crafting railings for the steps that take diners from the bar to the main dining area. Their first target date, April 2014, came and went. At Rancho T, everything from the barstools to the light fixtures has a story behind it. The lights were stashed in the basement of the former Home for Needy Confederate Women, now owned by the Virginia Museum of Fine Arts. The wood for the elaborate bar came from trees that grew within city limits, and in the seats of two barstools, you’ll find bullets that were found when the lumber was milled. Billy Bread’s Billy Fallen found them their chef. At Keswick Hall, Aaron Cross oversaw a large hotel kitchen with up to eight menus to manage at a time. “I had a big healthy dose of hotel,” he says. “It wasn’t the direction I’d ever had planned.” At 31, he wanted out of a big corporation and into a less stressful environment. 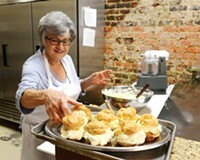 Cross’ grandmother, originally from Puerto Rico, lived with his family while he was growing up and cooked every day. Her influence can be seen in projected dishes that include pork shoulder tamales, rice criolla and flan con queso. Rancho T also will have burgers, fries and wings on the menu. But both men say the menu will change over time. Neither wants the particular style of food to pin them down. They try to explain. Tuffy looks at Vasaio. “Here’s the difference between Rancho T and Mamma ’Zu — what is Mamma ’Zu?” he asks. “An Italian American restaurant,” Vasaio says immediately. “It’s a slow evolution,” Vasaio finishes.